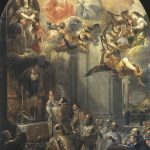 De pomponibus, or what it is all about – I komu to przeszkadzało? We ask the question to which we don’t expect a response: we know this response, because we know all possible questions and all responses; if we nevertheless ask them, it’s because someone needs to ask this question, so that someone other could response himself to it – motto from the fan page of I komu to przeszkadzało? (And whom did it bother?). The expression “And whom did it bother?” has become almost a permanent element crowning my statements concerning the changes which took place in the Church in the 20th century, especially in its latter half. Comparing the pre- and post-conciliar times, mainly in ceremonial issues, somehow must be ended with such a rhetorical question, which has been used for the name of this website, and earlier for the Facebook fan page. Now the entirety of the materials from the Facebook has been transferred here and has been merged with the blog, whose first post You are reading. I borrowed the name for it from the work of my favourite leader of the ancient world, as my texts will take the form of a comment to the current issues of the ecclesiastic life, above all its liturgical sphere. Looking through the website it is easy to notice which topics concern IKTP and what it is going to bring closer to the Reader. 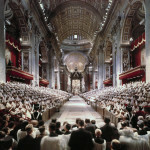 Apart from the descriptions concerning the ceremonies, vestments or other aspects of the Church before the reforms of Paul VI, in the blogging part I will try to describe in details the significance of mentioned issues and why one should return to the treasury of what is connected with the traditional liturgy. IKTP in its descriptions since the very beginning based on the actual state for the first half of the 20th century, as for the time when needless changes in ceremonies or vestments were not conducted yet. Pompon is a broad notion: it may relate to an object as well as something immaterial. Liturgy may be “pomponious”, but also garment, a privilege, a custom, a title or even gesture. The designation does not relate only to the sphere of ecclesiastic life, although a decent, lay pompon survived almost exclusively in ceremonies of the British royal court. Generally, pompon involves properly understood splendour, but this expression may also relate to completely opposite things, the example of which is the former monastic discipline; therefore both kissing the papal shoe during a solemn Mass and kissing a foot of a fellow brother within the framework of exercising oneself in humility is a pompon. Thus, the pompon may reveal itself both in majesty and in simplicity and often it is connected with a deeper symbolic sense, which affects its relevance as a sign. 4 Responses to "De pomponibus, or what it is all about"